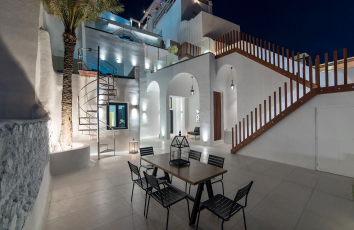 Luxury Villas Santorini. Luxury villas to suit your travel style. Bespoke luxury services and experiences. Santorini Concierge 24/7 at your service, covering your every desire. Luxury Villa in Santorini. Villa Heaven is a 4 bedroom villa, Cycladic style with a private pool and a garden located in Mesaria Village. Luxury Villa in Santorini. Villa Dream is a 3 bedroom villa, part of 2 villas complex that overlooks the volcanic nature, the cliffs and Fira. Luxury Villa in Santorini. 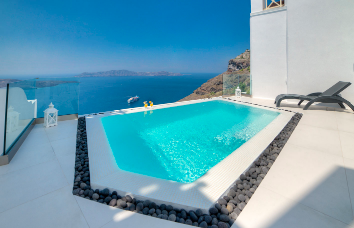 The Dream villa with private infinity pool that overlooks the picturesque volcanic nature the cliffs and Fira. Lifestyle Mangement Services, Party, Wedding and Event Planning, Personal Security Services. Your personal concierge will be 24/7 at your service covering your every wish. Personal Concierge Services in Santorini, Greece. Comprehensive solutions tailored to the specific needs of the VIP travelers. Our experienced team is at your service to create your dream holiday. Whether you're looking for a private chef, luxury catering or a private dinner our chefs brings the restaurant experience to your villa/yacht, making your event more exclusive and private. Enjoy the Santorinian lifestyle and experience unique dishes. Luxurious Wellbeing, Fitness, Aquafitness, and Pilates sessions, Aerial Yoga, offering unique classes in Santorini. Enrich your life with unforgettable yoga experiences. Every spa and wellness escape is perfectly-suited to satisfy all your vacation relaxation desires. Santorini private driver, chauffeur and limousine services. 24/7 private driver service in Santorini. From Helicopter Charter, Motor Boat and Yacht Charter to Luxury Car Rental Service. Have a luxury ride from a chauffeur driven car in and around Santorini. Chauffeur driven car hire services for Airport Transfers, Wedding, Events, VIP nightlife, Tours and Excursions. Leisure or Sport And Adventure Activities. Sunset tour in Oia, luxury cruise to Hot Springs, Thirassia, Red Beach and Akrotini, visit the wineries, cooking classes, volcano tour, rafting, diving, photography, sailing or yachting etc.